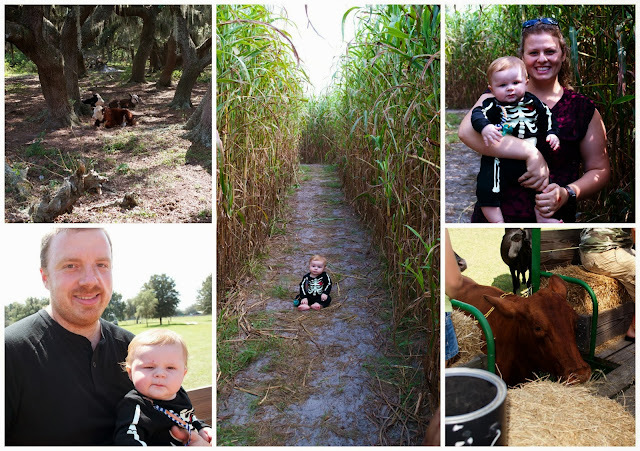 This past weekend we headed over to one of two corn mazes/pumpkin patches in our county. We had gone to the other one a couple of years ago and were fairly unimpressed so we decided to try this one in the hopes that it would be a bit more festive. We mostly wanted to get some pics of Will but we were hoping to have a little fun as well. 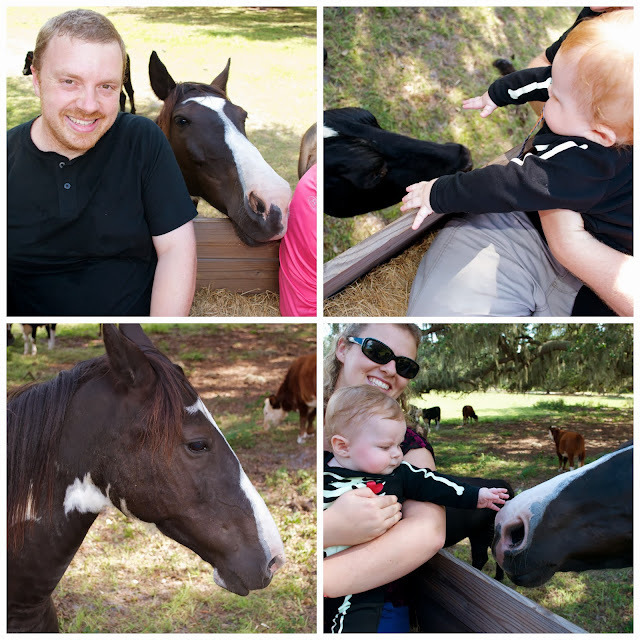 We started out at the giant hay bales and then checked out some animals including a pig named pork-chop (which is comically sad IMO). 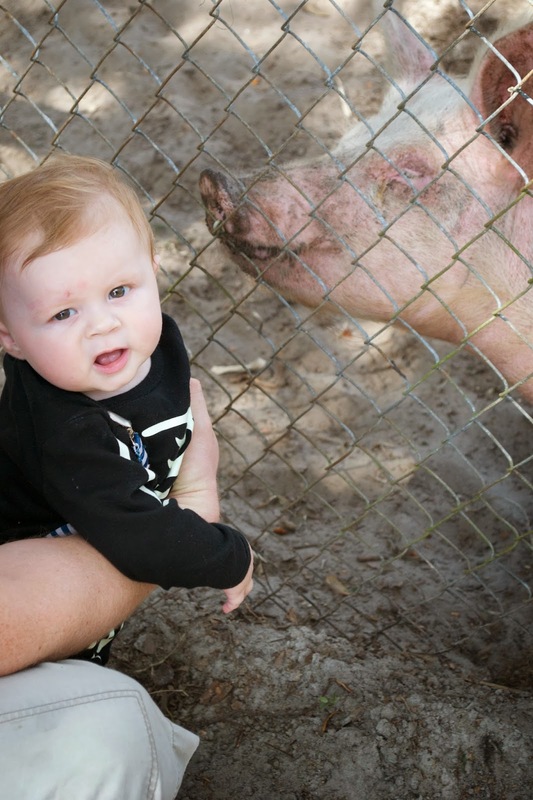 Will had never encountered either hay or pigs before and his reactions to both were pretty priceless. While this place didn't have a u-pick section for pumpkins, they did have a pretty nice selection of already picked pumpkins arranged in part of the field. 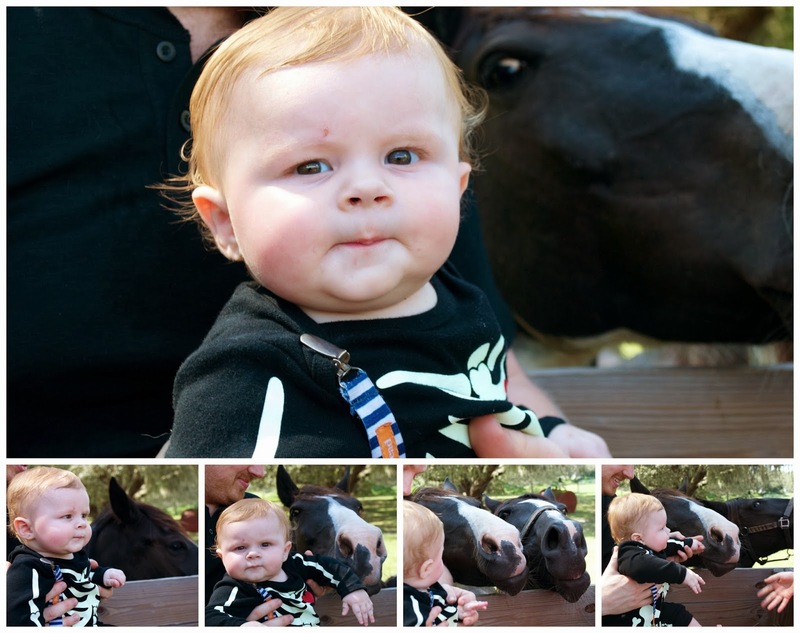 Will enjoyed playing with them and using them as a prop to practice his standing. 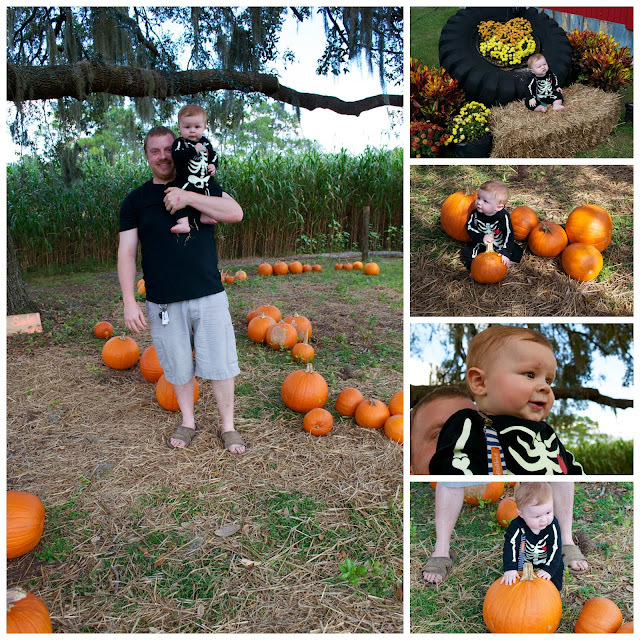 We ended up taking two pretty pumpkins home at the end of the day. 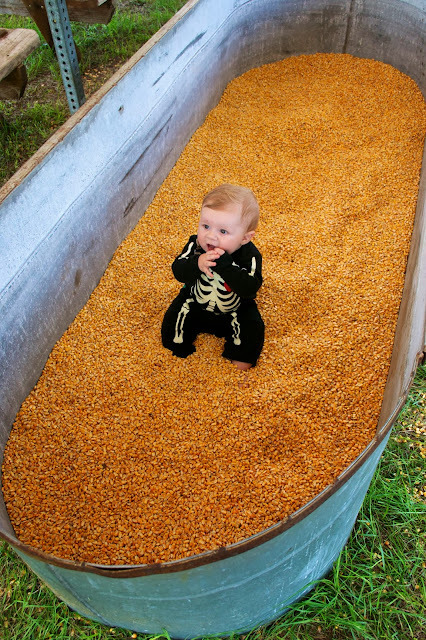 The dried corn kernel pit was fun for all. Will desperately wanted to eat the kernels but was successfully distracted by Nate making it rain corn and swishing it around. The corn maze was not actually corn; it was sorghum. Corn doesn't grow very tall in FL (and resulted in the pretty poor maze at the other place) but sorghum grows very tall. This maze was really well done. You couldn't see anything and it took us about 15 min to get through (using a left algorithm a la Nate) which was long enough to be challenging but not so long that you panic. My favorite part of the trip was the hayride. The owner brought us over to a nearby field to feed the horses and cows (one cow knew what was going on and basically climbed on the platform to eat the hay). Will was so funny. The horses came up right behind him and Nate, and Will had absolutely no idea they were there. We kept trying to get him to notice but he's responding really well to his name so every time I said "Will, Look" he would turn and look at me. I love the sequence of pics. It's like "what are you looking at? ", "really... this is kind of boring", "seriously, why are you staring at me? ", "Oh look! There is something there! ", "I want to touch them and hug them and probably try to eat them". Once Will recognized the animals' existence, he really seemed to enjoy watching them and trying to pet them. The overall experience was so great and the people who own and run it are so friendly. I don't know if our expectations were just low but we had such a great time that this is definitely going on a yearly to-do list. If anyone in central FL is looking for a great family friendly fall activity, the place we went is Harvest Holler. They have no idea we're writing about them, but we had such a great time they really deserve a shout out.